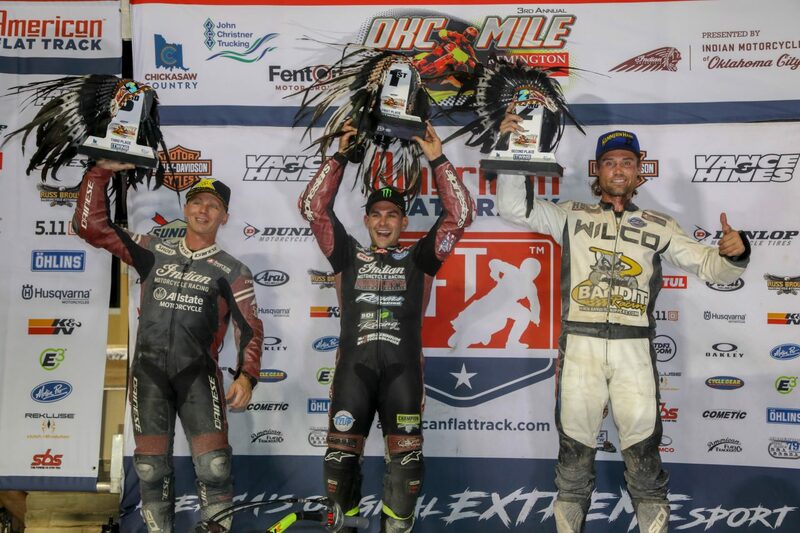 OKLAHOMA CITY, OK (JUNE 19, 2018) – Indian Motorcycle Racing and its Championship-winning Scout FTR750 race bike continued its dominance of the American Flat Track season by sweeping the top eight positions at the Oklahoma City Mile. Reigning Champion and Indian Motorcycle Wrecking Crew rider Jared Mees won in commanding fashion and earned his seventh victory of the season. Indian Motorcycle privateer Henry Wiles (Bandit Industries/Wilco Racing/Willy Built) continued his impressive season with a second-place finish, while Wrecking Crew rider Bryan Smith rounded out the all-Scout FTR750 podium by taking third place. Mees got away clean at the start of the Main and continued to lengthen his lead and ultimately won by 12.839 seconds ahead of Wiles. With the win, Mees ties Kenny Coolbeth Jr. (Nila Racing/Columbia Avionics) for 37 career wins and now ranks fifth all time and is the winningest active rider in American Flat Track, along with Coolbeth. Not to go unnoticed, Wiles raced to an impressive second-place finish. Traditionally known as a “TT master,” Wiles has seen success when on the Scout FTR750, which he’s raced in eight consecutive events starting in Atlanta on April 7. Since then, he’s earned six top-five finishes, including two podiums on mile-long tracks. Wrecking Crew rider Brad Baker finished fourth, while Robbie Pearson (R/J Performance) earned his first top-five finish of the season. Indian Motorcycle privateers Davis Fisher (Double D Performance), Jake Johnson (Estenson Racing), and Chad Cose (Indian Motorcycle of OKC) rounded out the top eight sweep with sixth, seventh and eighth place finishes, respectively. Through nine races, Mees leads with 195 points, while Wiles is second overall with 136. Baker’s fourth-place finish advances him up the season standings to third place with 116 points. Coolbeth and Carver rank fourth and fifth with 105 and 100 points, respectively. Smith’s third-place finish propels him from ninth to sixth with 90 total points. The Indian Wrecking Crew and stable of privateers aboard the Scout FTR750 will continue its season on June 30th at the Lima Half-Mile. For more information on Indian Motorcycle Racing, backed by Allstate Insurance, the Indian Wrecking Crew and Scout FTR750, visit IndianMotorcycle.com and follow along on Facebook, Twitter & Instagram. For information on purchasing a Scout FTR750, please contact Racing@IndianMotorcycle.com.